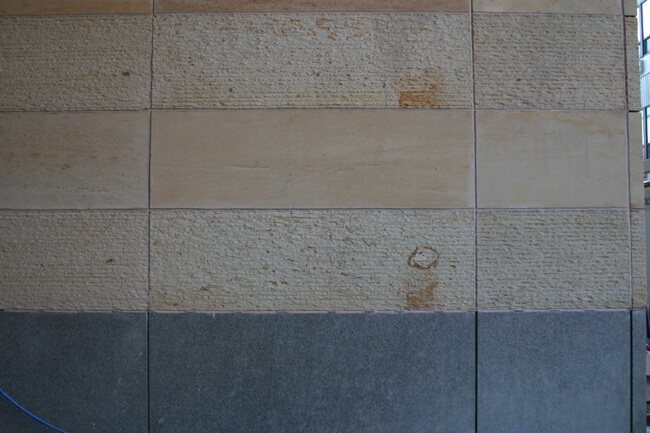 Case Study – Colored stone material for cladding a building? That was the question posed by the design team for this new medical center project in Bangor, ME. The design architects were trying to “wake up” the new elevations on this large addition to an existing medical facility. The previous wings had used pre-cast concrete panels installed vertically on the building, very utilitarian, but not “beautiful”. 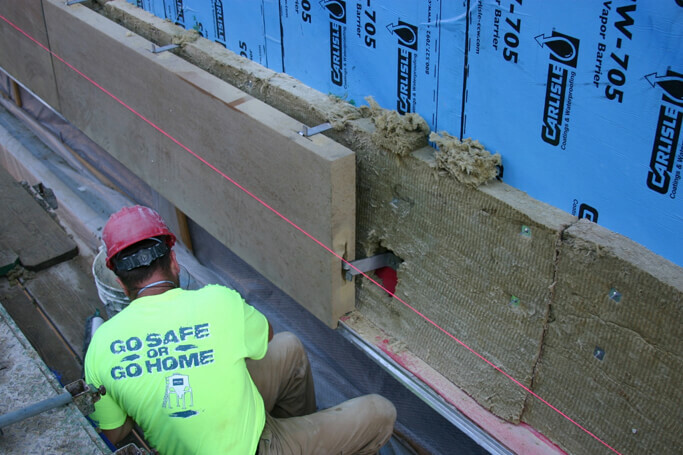 The size of the proposed stone cladding panels was 24″ tall x 84″ long, pretty large for stone panels at 4″ thick. VSA introduced the designers to many colorful, natural stone options from domestic sources to add a splash of color and still be economical. After reviewing limestone, granite and sandstones from quarries within 500 miles of the project, the designers honed in on the variegated color of Pleasant Hill Buff offered by Vermont Stone Art (VSA). The color range was just what the designers wanted to give the new elevations compelling visual interest. 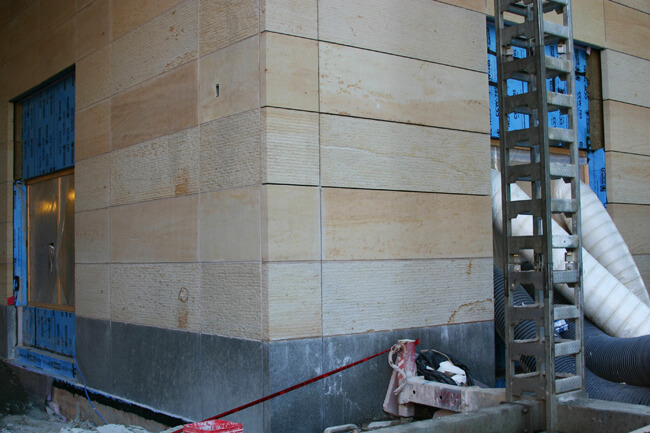 Our VSA design engineers made many recommendations and ultimately the variegation of colors was viewed by the design team as a valuable characteristic of the sandstone. We’re happy that we could provide information and the right stone materials to meet the design team’s needs on this project. 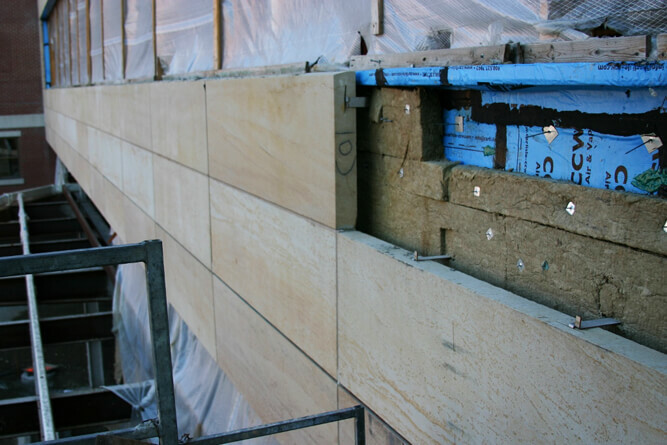 The project is presently under construction, with 4″ veneer supported by structural steel bearing shelves, and each stone panel stacked and tied-back with split-tail anchors in the head and bed joints. These progress shots show some of the stunning colors in this sandstone, even though it has not undergone final cleaning. The masons, at first skeptical about the workability of sandstone, have praised this material as not only beautiful, but very easy to cut, trim, and anchor. Even the scratches caused by normal construction were easily removed with 50 grit mechanical sanding pads. To date, this project is going smoothly and addressing the client’s needs, and we look forward to showing everyone finish photos upon completion. “Use color, too, when you build with stone,” so goes the slogan from an old Briar Hill Sandstone ad sheet circa 1922, and it’s still true today, proof of the enduring value, quality and beauty of natural stone supplied by Vermont Stone Art.